I have been a user of Jonathan Ledgers The Best Spinner for a number of years now. This tool has proved extremely valuable when it comes to generating content. Check out my The Best Spinner Review if you would like more information about content spinners. 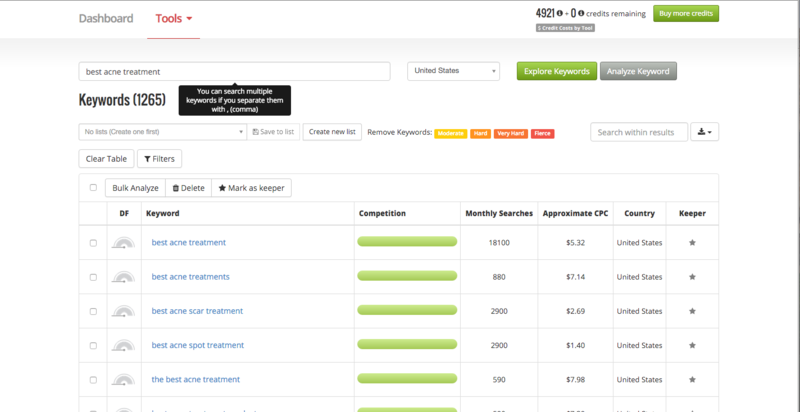 When I found out Jonathan had his own keyword research tool I thought I would give it a try to see if it is any good. Has everything you would need from a decent keyword planner. Not the cheapest option. But then you get what you pay for. Really easy to use and understand. Summary: Keyword research is the foundation of success online. 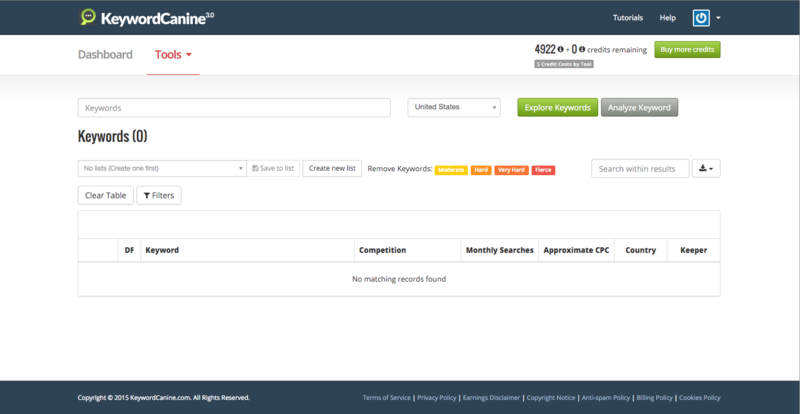 Keyword Canine has all the features you will need to target high volume, low competition keywords. Plus uncover keywords you haven't thought of. If you only have the budget for ONE tool to assist you with SEO, then make sure it is a keyword research tool. To put it simply, a keyword is a search phrase, something that someone types into a search engine, that you are trying to rank for. If I was to type into a search engine - THE BEST WEIGHT LOSS TIPS, then in order for my page to appear in the search engines, I would have to optimise that page for that particular keyword / search phrase. In this instance, I would be optimising the page for THE BEST WEIGHT LOSS TIP. I am not going to go into too much detail on how you carry out on page SEO, as that is a blog post all in itself. Simply knowing that keywords are important is a good place to start, because unless you are actually targeting a specific phrase or keyword, then you will find it very difficult to get pages ranked in the search engines. Short tailed phrases tend to capture searchers who are still in the research phase. Short tailed searches therefore, are typically people who are not quite ready to make a decision. To find out more or to sign up for Keyword Canine click the link below. Long tailed searchers have already done their research when they find your web page. Long tailed searchers are therefore more specific about their needs. If a long tailed searcher is not in the advanced stages of research, then they are in a desperate situation to get an immediate problem resolved. Take for example the phrase ACNE. This will return results that probably have some scientific research on acne. Whereas WHAT IS THE BEST ACNE REMEDY, suggests the searcher knows what acne is, knows that there is a remedy for it, and wants to know what the best remedy on the market is. With search engines becoming more and more sophisticated, it has been long said by many in the SEO community, that keyword research is old hat. With voice search becoming more and more common, they couldn't be more wrong. Keyword research and in particular long tail keyword research, is very much alive and relevant. ​A friend of mine runs a website that installs kitchens. He recently put a question out on Facebook. "If you were looking for kitchen installers, what would you type into Google?" My friend was attempting in his own way, to carry out keyword research, with a Facebook post. Although I am sure it uncovered some hidden gems for him. It isn't very scientific. My friend does an amazing job of installing kitchens, but he really does need to work on his keyword research. The problem is that we all 'Google' things or type things into the search engines differently. The search engines do try and assist us with auto suggestions as we are typing, and this can form the basis of our keyword research, but in order to get the best results, we need to do proper keyword research. So many ignore keywords. They then wonder why their pages don't rank and they get no traffic! You can use a Google Adwords or Bing to perform your ​keyword research, as well as scrape the results from the auto suggestions in the different engines. Whilst this is a good place to start, Google doesn't show us all of the keywords in Google Adwords. This is because they would much rather you pay for your search engine placement, rather than appear there organically. Keyword Tools can help us because they show us not only the keywords we have typed into the tool, but they also suggest other keywords that are on the same theme, but may be easier to rank for. The golden rule of keyword research is to find high volume, low competition search phrases, that you can target with your content writing. These keywords can be the difference between success and failure with your campaign. Get 99 keywords that signify buying intent, for use in any niche! I have been a long time user of Long Tail Pro, which in my opinion is one of the best keyword research tools available on the market. The only thing I don't like about Long Tail Pro is that it runs as software on my computer. Whilst this isn't the end of the word, it means that if I don't have access to the computer where it is installed, I cannot do my keyword research. In addition, it's very difficult to run reports and do real time analysis on software that runs on a computer. This is for the simple fact, that if the software isn't running because my computer is switched off, then it isn't able to do any analysis. 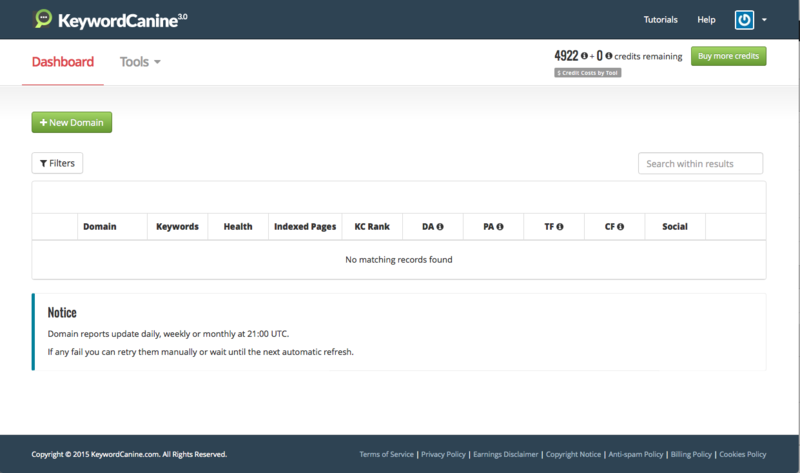 There is the VPS option, which is a server or PC running in the cloud. If you are looking at a VPS option then check out my review on Vultr. Keyword Canine runs as a web application, so you only need a web browser to access it. In addition, ​because web applications are hosted on web servers, they tend to be better at tracking things and running reports. Analysis - a nice clean interface that builds up with useful as you enter data into it. 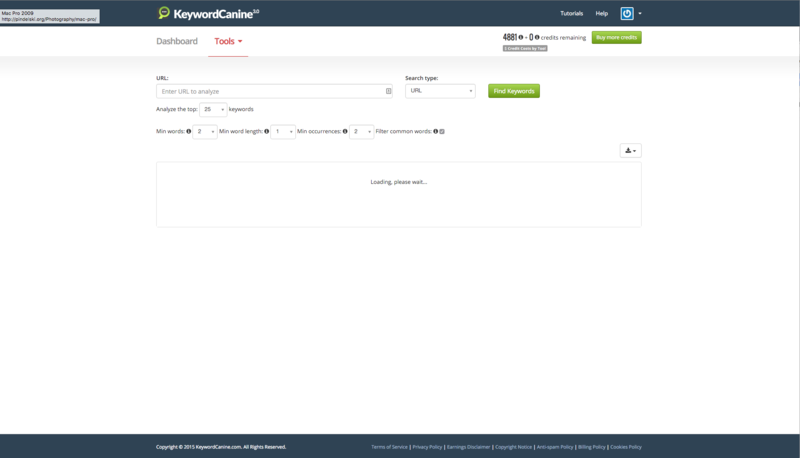 Selecting Tools > Keyword Research opens a dashboard so you can start your research. Analysis - There is nothing over complicated here. Just type the keyword you want to target and the region, for example United States region, and Keyword Canine does it's magic. As you can see the phrase BEST ACNE TREATMENT produces some very competitive results, this is where Keyword Canine comes into its own. Not only do I get a competitive analysis and alternative keyword suggestions. I can start to build up a list of filters to rule out the keywords I have very little chance of ranking for. Links fall into three categories, the good, the bad and the ugly. These will boost your rankings and help you to climb the SERPS. These will result in your website being penalised. Neither good nor bad. They don't move you up the SERPS or get you penalised. They just make your link profile look ugly. Analysis - You need to monitor the backlinks and keep your eye on them. Otherwise you may find your results heading in the wrong direction. 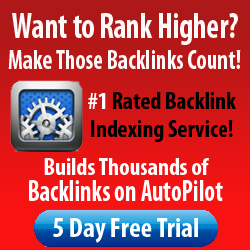 Keyword Canine does a KC Rank for your backlinks! Keyword Canine's has it's own link quality test. I have to say it's darn good. Climbing the SERPS is what we are all about. Keyword Canine's rank tracker isn't the best rank tracker around, but it's better than nothing and included in the price. A nice little addition to the KC Keyword Tracker, is that when you click the information icon, it shows you instantly how many searches per month that keyword gets. Analysis - Simple keyword tracker that will probably not replace your existing keyword tracker. However, it is a good place to start. Track keywords in Google, Bing, Yahoo, AOL, Yandex, DuckDuckGo, Excite and Lycos. Search Digger scraped Google autosuggest, Yahoo, Bing, Amazon, Ebay and YouTube for keyword suggestions. It's also possible to target country specific searches. 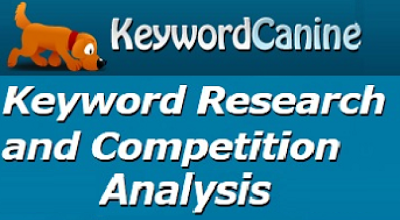 When doing keyword research this is a brilliant place to start. Most keyword ​tools scrape Google Asense for their results. Google autosuggest, Yahoo, Bing, Amazon and eBay are usually overlooked. All of those are search engines in their own right and will help you paint a different picture to Google Adsense alone. All of these different engines will return active searches whereas Google Adsense can be a little outdated as to what is a hot search right now. I normally scrape Goog Autosuggest using Scrapebox or keyword tool.io​, I have uncovered some golden keywords over the years doing this. Keyword Canine will save me a shed load of time as I no longer have to do this. Scrape Google, Amazon, eBay and YouTube for keywords! I have uncovered golden keywords, from sources other than Google, that rank really well in Google. Simply enter the URL of the page you would like to analyse and Keyword Canine will do the rest. You get a full break down of what the main keywords are on your page. This is useful to help prevent you from getting a penalty for overusing a particular keyword. This is also really useful if you want to analyse the competition to see ​the keyword density of a particular keyword is. Especially if the page you are analysing is on page one of the search engines. One of the keys to success is sometimes replicating the success of your competition. Not only can you reverse engineer a particular URL, it is also possible to enter a keyword and the number of searches you would like it to return. For example BEST DOG KENNELS and the top 25 search results. You can then use this information to your advantage. There is the option to buy more credit should you run out of them. This brings me onto the negative part of Keyword Canine. I am not a fan of this credits based system, especially one that is difficult to keep track of. As it was launched two weeks ago, I don't know if 5000 credits is enough for a months use. I understand that if you have a lot of heavy users, then the costs can spiral out of control for the software creator. So you need a mechanism to keep the pricing competitive for everyone. Pros: A very decent keyword research tool and one that I will be using on a regular basis. Cons: The credits system needs to be looked at to make it easier to calculate how many credits are needed each month. Otherwise this would be a 5 star review.